Visceral leishmaniasis (VL) is one of the most neglected infectious diseases with an annual incidence of 50,000 to 90,000 new cases worldwide. Cases of VL are characterized by irregular bouts of fever, weight loss, hepatosplenomegaly, hypergammaglobulinemia, pancytopenia and anaemia. Diagnosis of VL is based on combining the clinical examination involving a history of fever of more than two weeks with splenomegaly and hepatomegaly along with positive parasitological or serological tests. Demonstration of amastigotes by microscopy is invasive, risky and technically demanding with the limitation of low sensitivity. 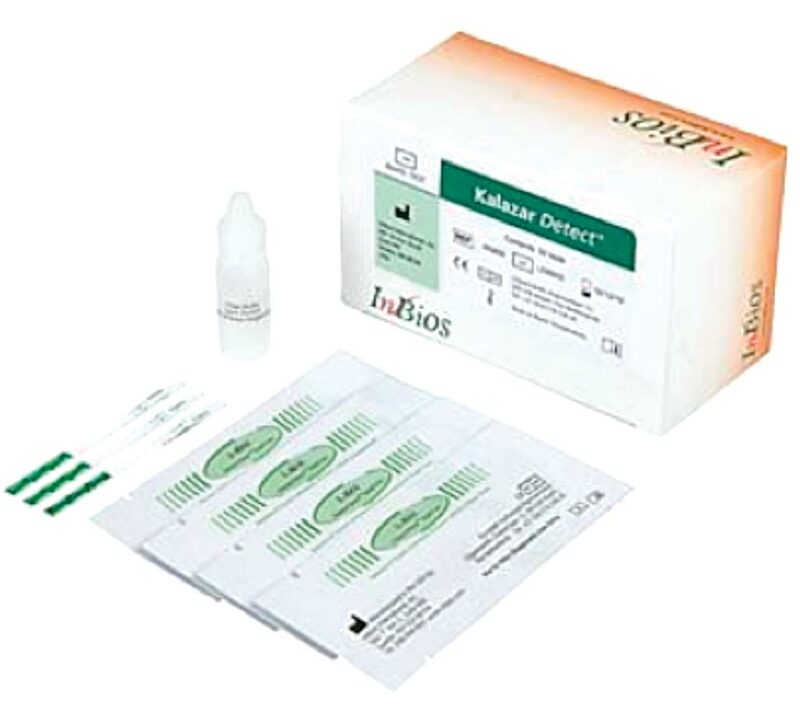 Image: The Kalazar Detect Rapid Test for Visceral Leishmaniasis (VL) is a rapid immunochromatographic strip assay for the qualitative detection of antibodies to L. donovani complex in human serum to aid in the presumptive diagnosis of VL (Photo courtesy of InBios). A team of scientists working with the Safdarjung Hospital Campus (Pune, India) included in a study a total of 267 eligible participants, which comprised of 179 VL cases and 88 controls. VL suspects having fever for more than two weeks and coming from VL endemic area were tested using the rapid diagnostic test, the rK39 strip test and/or microscopic examination of Giemsa stained splenic or bone marrow aspirates for the presence of Leishmania donovani amastigotes. The team developed a simplified Loop Mediated Isothermal Amplification (LAMP) assay based on direct blood lysis, DBL-LAMP, was developed and verified for its diagnostic accuracy. They also performed a closed tube LAMP assay previously described. At the end of reaction, the tubes were allowed to cool down to room temperature and a brief spin was given to allow mixing of SYBR Green I with the amplified product. The positives instantaneously turned green while the negatives remained orange. The scientists reported that the sensitivity and specificity of the LAMP assay were 98.3% and 96.6% respectively. ROC curve analysis depicted no significant difference between area under curve (AUCROC) for LAMP assay and rK39 RDT, indicative of LAMP as an excellent diagnostic test. DBL-LAMP assay, performed on 67 VL and 100 control samples, yielded a sensitivity of 93.1% and specificity of 100%. The DBL-LAMP assay for VL diagnosis was easier to perform along with reduction in cost and turnaround time, putting it one step forward towards field application. The overall time for performing LAMP assay was reduced to half (1.25 hours) when direct blood lysis was used rather than column extracted DNA which surpassed the requirement of DNA isolation by the use of crude direct lysed supernatant in place of DNA. The authors concluded that the validated closed tube LAMP for diagnosis of VL will provide impetus to the ongoing VL elimination programme in the Indian subcontinent. The assay based on direct blood lysis promotes its scope for application in field settings by further reducing time and cost. The study was published on November 15, 2018, in the journal Public Library of Science Neglected Tropical Diseases.